Choosing a skincare product has never been an easy task. Shelves are lined from top to bottom and left to right with lotions and moisturisers. Varying in price range and all boasting their own unique benefits, choosing something that you like and can afford is often overwhelming and confusing. So much so that there are typically two kinds of shoppers. Those who know what they like and habitually use the same products without ever changing. And those who are drawn in by marketing. Marketers are smart and to make their products stand out among your unlimited options, they must work hard to grab your attention, often using only one or two words. For the most part, those are the key words and phrases you want to hear when choosing your skincare, and are words which almost always make your decisions instant. But, this is a mistake. Firstly, what you put on your skin costs you money so you need to make sure you’re paying for what you think you are. Secondly, when you’re adding toxins and synthetic ingredients to your skin, and therefore, into your body, you have a right to know about it. 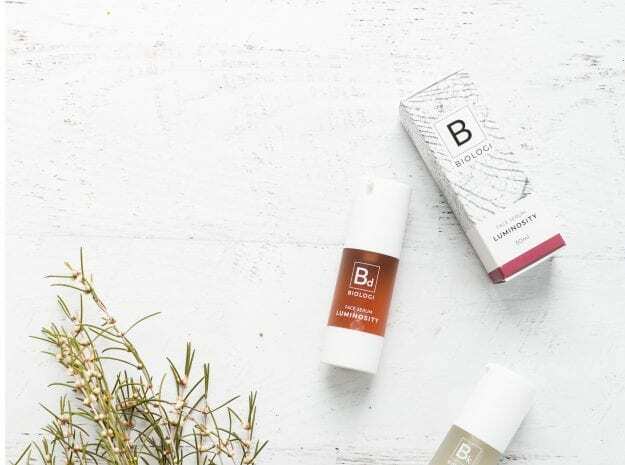 So, to help you cut through somewhat questionable, yet prevalent, marketing strategies, we’ve put together a few industry ‘secrets’ that will help you make informed choices the next time you buy a skincare product. We believe that water belongs in plants, the ocean, and hot cups of tea and not in your skincare products. Water is often the first ingredient listed on skincare labels, meaning it’s diluting the active ingredients – the part that will actually help your skin – just so the product goes further. Don’t pay your good money for something that is majority water, all this is doing is weakening a product and helping it stretch further to increase the manufacturer’s profit. Choose undiluted products, like Biologi, to get maximum benefit from your skincare. Somewhere along the lines, we’ve been led to believe that all ingredients must appear on a label in order, perhaps we’re getting confused with food? It’s correct that all ingredients must be listed, but anything less than 1% can be written in any order. So, if your natural ingredient (let’s use rosehip oil, for example) is fourth or fifth from the bottom of the ingredients list, it could still be the smallest ingredient in your ‘naturally-derived’ product. The term ‘derived from’ is misleading. Natural ingredients can be processed and altered with synthetic chemicals and still labelled as ‘naturally derived,’ but they are no longer natural in any way. Surfactants and emulsifiers are a perfect example of this. These types of chemicals are produced in factories so they can combine hydrophilic (water liking) and hydrophobic (oil liking) ingredients together and to give the product foaming/cleansing properties. These synthetic ingredients make up large amounts of a ‘naturally derived’ skincare product and are usually next in line after water. Anyone can say ‘derived from’, and nobody needs to prove it. If natural products are what you’re looking for, be very careful of anything that claims to be ‘derived from’ a natural source. According to the Australian Certified Organic governing body, products can contain as much as 29% non-organic properties and still call themselves ‘organic’. Read the facts on organic certification here. In today’s time where health, wellness, and the environment are all a problem that ‘organic’ solves, using the word in marketing is an easy sell. Familiarise yourself with what ‘organic’ used on your labelling actually means for your products. So, now we’ve enlightened you about what to avoid, here are our top tips when choosing your skincare products. Active ingredients are those which give the most benefit to your skin. Many products separate an ingredients list into active and inactive ingredients, and those are the ones you should favour. If you’re concerned with putting natural products on your skin, don’t choose something purely because of a ‘naturally derived’ tagline. This DOES NOT necessarily mean natural, and you’ll still find a whole lot of unnatural chemicals and diluting ingredients if you study the label. While money is a concern for most consumers these days, if the cost of your product seems too good to be true, it’s because it is. It costs money to manufacture quality products for your skin, and the reality is that no company will ever run at a loss just to give you a good product you can afford. If your product is cheap, it’s made with inexpensive ingredients, and a lot of them. End of story. Taglines are clever marketing. They’re unregulated, and, in many cases, simply untrue. Always refer to your ingredients list (printing of which is only required on the actual product label) and take what’s written on websites and other platforms with a pinch of salt. They notoriously only disclose the more appealing ingredients which are often added to a product in the lowest quantity. The Biologi product range doesn’t have an ingredients list. We’ve created our range using a world first extraction method which allows us to keep pure plant extracts stable and active and in high enough quantities that they don’t need diluting agents or synthetics to make them consumer-friendly. And, most importantly, they work. When you choose Biologi, you don’t get synthetics, chemicals, diluting agents, fillers, additives, or parabens. You get 100% active pure plant power. Natural ingredients should be found in nature, not conjured up by a marketing team. Skincare is the least regulated industry in the world so please research your products, be wary, and become an informed consumer- smart skin is healthy skin!